Ryan O’ Rourke’s seventy-minute goal broke Wicklow hearts as Leitrim remain top of division 4 in what can only be described as an absolute classic. Hold on to your hats as you’re in for a real roller coaster of a ride here, many were wondering after last week’s magnificent team display against Wexford could Leitrim go and out and re cap another team perform and by god when questions were asked of this team they came out and they answered them. From start to finish this game had everything that had you on the edge on your seats and yet you wonder why games like this just because its only division 4 is not show on TV, overall credit has to go to both of these teams and its certainly a game that will be talked for years to come. Both teams were very slow starting off but the game ignited into life in the tenth minute when Mark Doyle finished to the net after a great team play involving Theo Smith, Dean Healy, Mark Kenny and Anto Mc Loughlin, from then on, both teams went on to trade point for point for the remained of the half with only the bare minimum separating them at the interval 01-05 to 00-07 in favour of Wicklow. 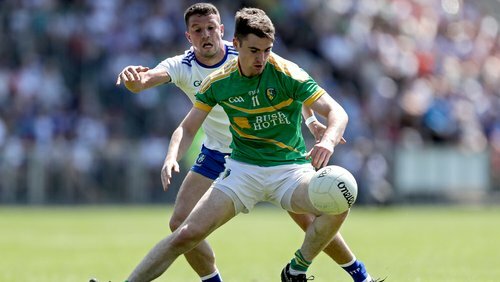 Substitute Evan Sweeney made is introduction to the game in the thirty-eight minute and made a very swift contribution with his effort sailing over the bar to draw the team’s level, then moments later Damien Moran put Leitrim in front. Jack Heslin came within centimetres of waving a green flag as his effort was brilliantly saved by Mark Jackson which went up and over the bar for a point. Both teams very reliant on frees throughout the second half, as the clock ticked into the seventy-minute Wicklow were leading by the bare minimum but then up stepped Ryan O’ Rourke as he slotted the ball passed Mark Jackson to send the away fans into raptures, Further points came from Shane Moran and Gary Plunkett as Leitrim will once again sit happily on top of the league can anyone stop them. As for Wicklow there were some great displays through the game but man of the match has to go to goal keeper Mark Jackson with his strong contribution of 0-4 points.